Environmental assessment discovers dhubs on intended project site. Dhub, or spiny-tailed lizards, spend most of the day basking in the sun, so they typically inhabit rocky areas with good shelter for when they need to burrow underground. However, they have suffered rapid population declines in recent decades due to habitat loss and overhunting. Today the International Union for Conservation of Nature (IUCN) has classified the species at regional and international levels as “Vulnerable.” This means they face a high risk of extinction in the wild. Relocating the Dhubs Bulk earth moving work and site preparation activities for the Fadhili Gas Plant were scheduled to begin mid-April of 2015. 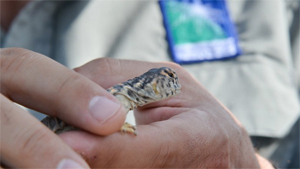 To protect the local dhub population, Aramco's environmental protection department arranged to capture and relocate the reptiles before construction activities at Fadhili began. Relocation activities began in March 2015, and the dhubs have successfully been moved to their new home in a protected area within Manifa and are doing well. Further monitoring of the relocated dhubs will continue for many months, and they are expected to start breeding in the spring season and bring to life a new dhub colony at Manifa.